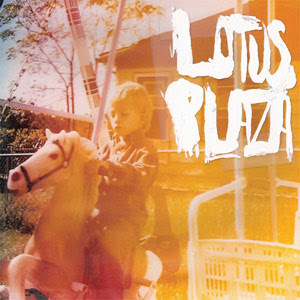 Lotus Plaza is the moniker used by Deerhunter guitarist Lockett Pundt to showcase his solo work. I have mixed feelings about Pundt's main gig, but I've been spinning Floodlight Collective on a regular basis since I first snagged a copy last week. The lush guitars and hazy compositions give the record a great deal of depth. Each listen reveals new, interesting nuances buried in the tracks. I suppose the most obvious comparison here would have to be to Deerhunter (Bradford Cox even makes an appearance on the record) but overall, Lotus Plaza does stand alone as its own musical entity. You won't hear too much of Microcastle on this album. Worth checking out, especially if your NCAA bracket is already busted and you're looking for a nice soundtrack to self-medicate to. you wouldn't happen to have any shadowy men on a shadowy planet would you......? I want some old Prussia albums but I can't find any. I think there's one called "Artless". I need more of them. Man your blog is really cool, I take from it music that I had not even thought that it existed, thank you very much and keep it on! Greetings from Barcelona, Miquel. just a heads up, this link is down. great blog.